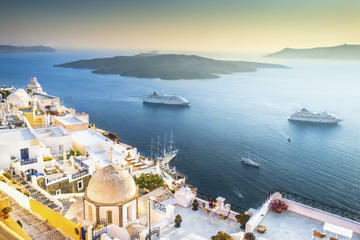 "Sail south through the sunkissed Cyclades islands on a 7-night sailing adventure by yacht that starts from Mykonos and finishes on Santorini. The budget-friendly independent cruise allows you to discover some of the most picturesque Greek islands while helping out the crew as you sail. Soak up the blissful solitude, swim and sightsee by day, and dock each night on Mykonos, Naxos, Amorgos, Ios and Santorini as well as a smaller lesser-known island in the archipelago. Numbers are limited to nine on this small-group cruise, ensuring a personalized experience. it's small and intimate with just five cabins and three shared bathrooms that are also used by the crew.